The New York Yankees face an interesting offseason before the 2017 season. Do they use some of their new top prospects to fetch what they need in order to make a run at the postseason next year or do they continue the youth movement and see it through until the end? That is still yet to be determined but either way the Yankees decide to go in their GM Brian Cashman has options. 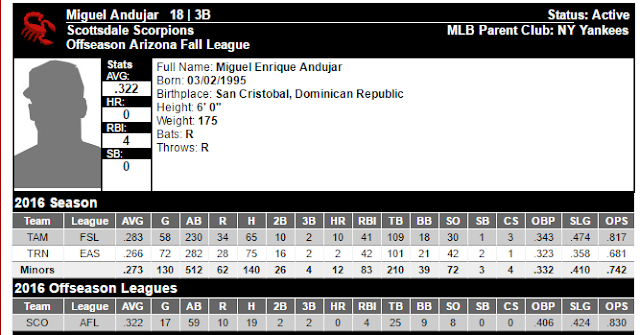 One of those options is third base prospect Miguel Andujar who has generated a ton of interest this winter down in the Arizona Fall League. Cashman told reporters last week that he has already received calls on Andujar and his availability so stay tuned for that.